817 Garden Street - Lawrence Thompson Architects, INC.
“Classic proportions soften this building..” John Pitman,Arch. Residences and Commercial from the West. 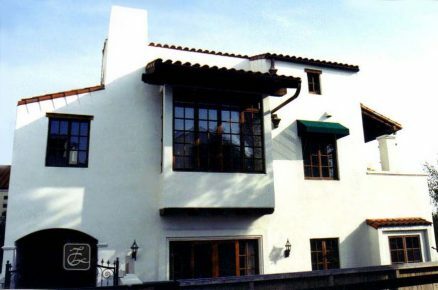 This four story Spanish Colonial theme project in Santa Barbara, with large top floor penthouse and roof deck, has two floors of offices below and underground parking. The building was redesigned after the original foundations and rear retaining walls were executed by the prior owner, a local architect, leading to a rather formal front facade. The residences occupy the quiet rear side of the property, with the upper residence enjoying City fine views. Contractor Greg Marek deserves special credit for the success of this project.